The two weeks prior to Easter were School Holidays here in Victoria and I spent mine in a way I wouldn’t recommend. I was hospitalized with a Gall Stone attack in Canberra and then had the offending Gall Bladder removed in keyhole surgery in Melbourne last week. It is often said that “behind every cloud there’s a silver lining” and this was true in my case. Beautiful flowers arrived from thoughtful friends and family which lifted my spirits and are still brightening my days. Ever the Art teacher I want to share these flowers, their colours, shapes and their beautiful arrangement with our students and Blog visitors. The florist from Say it with Flowers who created this arrangement is an artist who uses flowers like another artist would use paint. I hope that seeing it will brighten your day too. Last Term our Grade One and Two students spent time painting and drawing Australian animals. 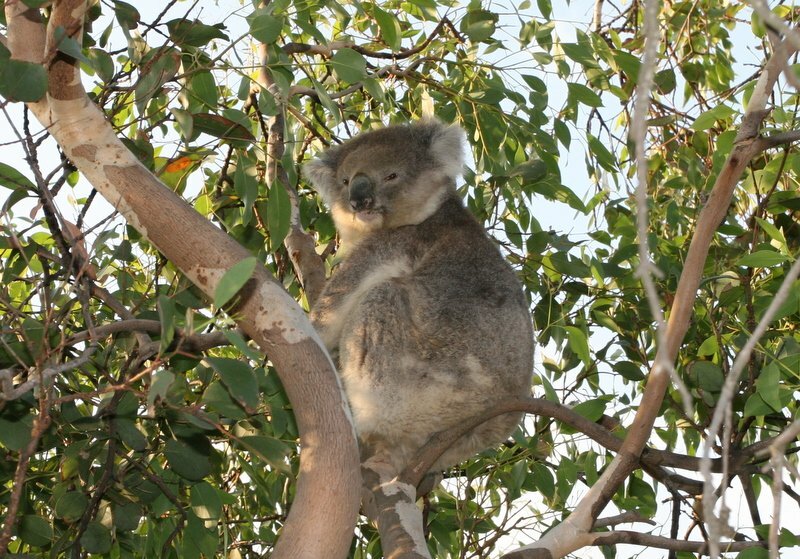 They were pleased to meet the cheeky koala, Blinky Bill, but were also eager to try drawing some of our other interesting Australian animals such as the Echidna. Dylan’s picture not only shows the Echidna’s protective spines but he has also added its preferred food (ants) and a beautiful bird flying overhead. Congratulations to Dylan of Grade 1 LW. Our Grade 5 and 6 students studied the Art of Graeme Base and drew for most of last Term and, although eight one hour lessons may seem a long time, I realized how important it was to keep the momentum going so that their confidence in their drawing continued to grow. With the emphasis on Literacy and Numeracy in schools providing less time for the Creative Arts I worry that drawing, painting, collage , modelling etc.are not getting the emphasis they deserve. Julian’s crocodile is a case in point. I gave him plenty of time to persevere and complete this animal character and I am proud to display it on our Blog. But where could we go from here? This character lends itself to a story, a name , a setting and a sequence of events, maybe a cartoon strip. I’m not saying that should happen with every drawing . It’s just that by taking artwork as a starting point for discussion or as a stimulus for further work we allow our students to see the connections between Art and Literature as evidenced in the incredible work of Graeme Base and Dorothy Wall with her Blinky Bill series. One hundred years ago motoring enthusiast Lord Montagu of Beaullieu commissioned sculptor Charles Sykes to make a likeness of his secretary Eleanor Thornton to grace the front of his Rolls Royce car. Since then the Spirit of Ecstasy, as she is knwn in Britain, or the Flying Lady, as she is known in the USA, has become well loved and recognised on the bonnets (hoods) of thousands of Rolls Royce cars throughout the World. The much photographed lady stands looking forward on a Rolls Royce Silver Ghost car in Yass, New South Wales. The historic house in the background is Cooma Cottage. Half way between Melbourne and Sydney at Gundagai, New South Wales, there is a wayside stop for petrol and refreshments which features a statue of an Australian working dog sitting on a “Tuckerbox”. Such a box was originally used to keep the food provisions for the long journey before the days of cafes and fuel stops. Just as I was about to take the photograph an old black Kelpie dog entered the scene, as if to pay homage to the dogs represented here. Generations of worthy canine heroes, many Pioneers and innumerable travellers have passed this way over the years. On April 6th 2011 I felt honoured to stand in this place of national significance and reflect upon the contribution each one of us makes to our country’s heritage. Last week I had the pleasure of beginning my School Holidays early and I visited Canberra which is Australia’s national capital. Besides all the activities organized by the car club to which I belong I took time out to visit two of our nation’s treasures, The National Gallery of Australia and the National Portrait Gallery. My favourite exhibition at NGA was the Ned Kelly Series by Australian Artist Sidney Nolan. I am pictured with one of the many sculptures which surround the National Gallery and the orange sculpture is in the forecourt of the National Portrait Gallery. I would thoroughly recommend a visit to both galleries as they so aptly capture our nation’s history and heritage. Every six months Victorian teachers go through a review process at the school level. Today it’s my turn and as usual it is hard to express everything I’ve learnt since the last review. Last November I had the opportunity to visit four schools in Fiji. I was already a keen blogger and user of ICT but this made me keener still to make the most of the opportunites we have in our school and to broaden my students’ view of the World. I see the creative use of current techologies to enhance learning and to provide connections between people throughout the World as vital to the future of humanity. In my own way I hope that’s what I’m doing at Taylors Lakes Primary School in my 36th year of teaching and my 58th year of learning. Our students have been taking a closer look at our Australian animals and representing them using different media. 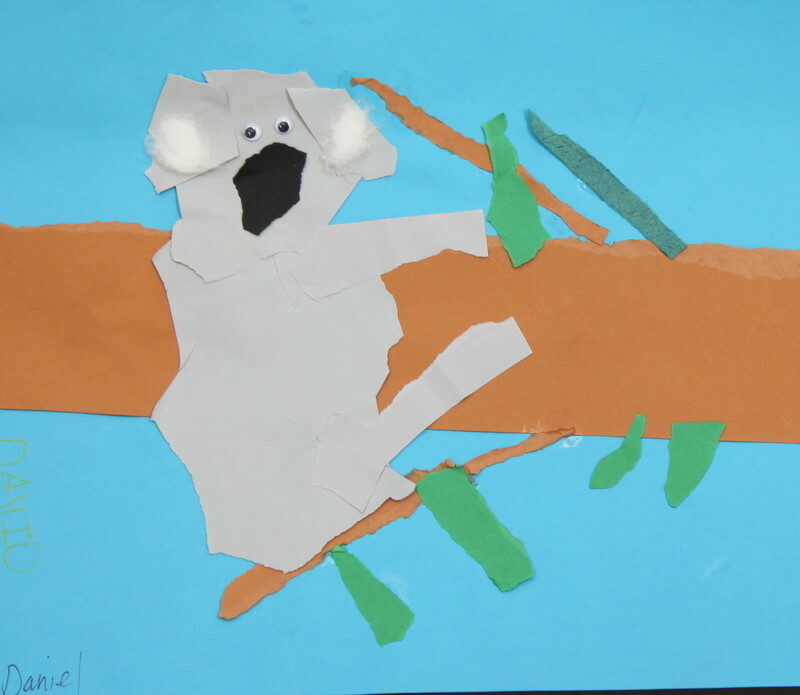 In the lower part of the school Preps used Collage ( Daniel – Prep JW) or paint to make Koalas from Koala Lou by Mem Fox while Grades One and Two painted and drew Koalas and other Australian animals. Our upper grade students include our Grades Three and Fours who made animals with Plasticene and Paper Magic Clay and Grades Five and Sixes who used watercolour paints with fineliner detail in their work. This Term’s work was mainly inspired by Graeme Base’s artwork and the work of Canadian artist Barbara Reid . Actual photographs from the Melbourne Aquarium and from the wonderful new iPad App, Museum Victoria’s Field Guide have provided us with great detail and inspiration for our artwork.